Most locals have never heard of Fort Winfield Scott but that is the official name of the military installation generally known as the Presidio of San Francisco. General Winfield Scott was a hero of the Mexican War who commanded the Union Army at the beginning of the Civil War. To honor him, the brick fortress built in 1882 on the Golden Gate was named Fort Winfield Scott. However four years later the fort was downgraded to a sub-post of the Presidio and the name stopped being commonly used. Instead people began to refer to it as Fort Point. 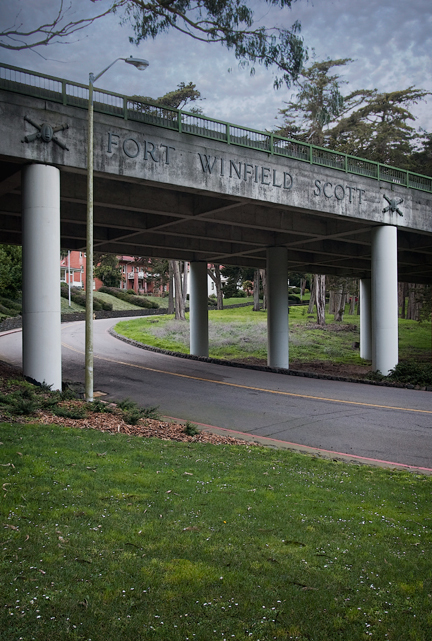 Twenty six years later, in 1912, the name Fort Winfield Scott was revived again. This time as an independent coast artillery post in the northwest quarter of the Presidio. The post contained a number of cannon batteries, buildings, and a large parade ground. But in 1946 this new Fort Winfield Scott was also reclassified as a sub-post and again the name stopped being used. Today almost the only evidence that two Fort Winfield Scotts ever existed in San Francisco is this artillery post entrance on Kobbe Avenue.